Communication skills are important in all aspects of life. It enhances our ability to convince, encourage, inspire and handle difficult situations. Both verbal and written communication affects our work relationships in more ways than one. 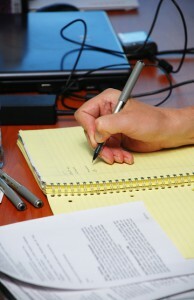 A person who is skilled in written communication can get the job done faster and more smoothly. Business writing is an art and a craft that can be learned through training and practice. It enhances the professionalism of the company, its image, and eases work processes. It removes misunderstandings, and creates a positive and professional environment within an organisation. A written business communication that has errors and is written unconvincingly damages the reputation of an organisation. Developing skills in business writing bring professionalism and positivity in written communications. An organisation communicates with its customers, business partners, employees and management through written communication on a regular basis. Businesses that excel focus on improving their written communication skills because it drastically affects their business interactions and brand image.